Although identical chassis's were marketed in different cabinets under either the HMV or Marconi brand names before WWII, this practice did not seem to continue after the war. The model shown is the 1117 that aimed for high quality reproduction, together with pushbutton station selection. 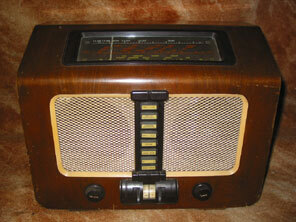 The pushbuttons are in a bank up the centre front of the receiver, leaving two speaker grilles either side. Behind the grilles are two loudspeakers, a pleasant change to most receivers with twin grilles that give the impression of two speakers but in fact only have one. One speaker is energised, whereas the other is not, and from a service point of view it is important that the speakers are connected in phase with each other. 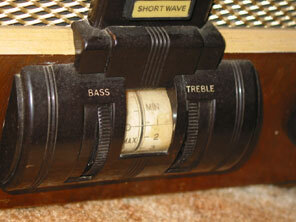 One feature that was unusual for a receiver marketed in 1948 was that separate treble and bass controls are fitted, rather than a single tone control knob. HMV must have been really proud of this feature, because the controls could not be any more prominent. They are housed in that bakelite bulge beneath the bank of pushbuttons, and take the form of edge-on wheels, with associated white bands that rotate with the controls calibrated 1- 10. And just to make sure there is no chance of missing this feature, the unit is illuminated with its own lamp, so one might alter the tone control and read the setting even in subdued light! 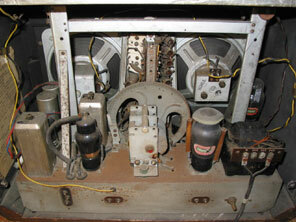 What with the pushbutton tuning, separate bass and treble controls, twin speakers etc one might expect to find a large multi-valve chassis inside the cabinet. 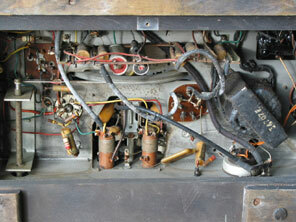 However the radio utilises nothing more than 4 valves plus rectifier. Valve line-up is X148, W148, DH63, KT61, U70. The receiver cost £26.6.5. Under-chassis view above right.